As we know in retail, we use articles master with variant and this variant articles are known as sub articles of a generic articles. Prepack article is a structured article with a group of variant articles. There would be predefined ratio of variant articles for prepack article. In retail textile business, generally prepack articles are purchased and generic articles are sold. As we know article’s variant does mean a different colour and size of a product. As example, a shirt can have multiple colours and multiple sizes. When business places an order to supplier, business would like to purchase it in box with a predefined ratio (like 2 pcs of red shirt with size S, 3 pcs of white shirt with size M and 4 pcs of yellow shirt with size L). Business doesn’t want to use 3 articles in purchase order, business will order to supplier with a prepack box (this box will contain the ratio as per defined by business). When supplier delivers the product into warehouse or distribution center, supplier will give it by box only. When business transfer the stock into store from warehouse, the prepack box will be unpacked to variant articles. Business doesn’t need to place order separately for different colour and sizes. Requirement planning can be done for prepack article, doesn’t require to run requirement planning for individual article. Manual effort reduction for processing physical counting process comparative to single variant article process. Easy to proceed transaction processing (e.g. creation of stock transfer order, creation of purchase order to supplier) with a single prepack article. SAP IS Retail switch must be activated. E.g. ISR_RETAILSYSTEM. Merchandise category for prepack article and variant article must be same. This sub-screen will allow us to enable assigning variant articles to prepack article. Two new standard movement types will be introduced as 319 and 320. Please proceed for the G/L account determination from configuration. Prepack Article – Inv.Finished Goods – Cr. Stock clearing A/C – Dr. Variant article – Inv.Finished Goods – Dr.
Stock clearing A/C – Cr. 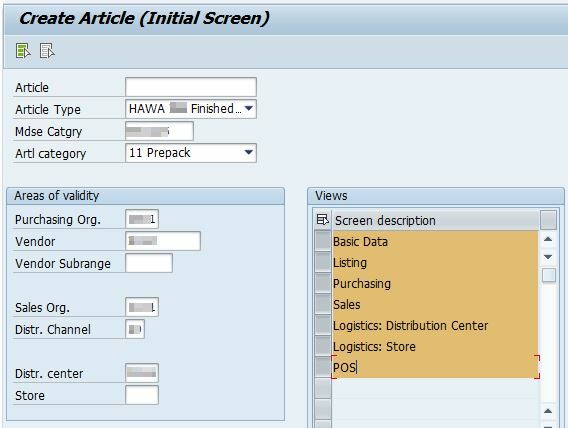 Before creation of prepack article, first you needs to create all variant articles. Once all variant articles are created, then proceed for prepack article creation from transaction code MM41. 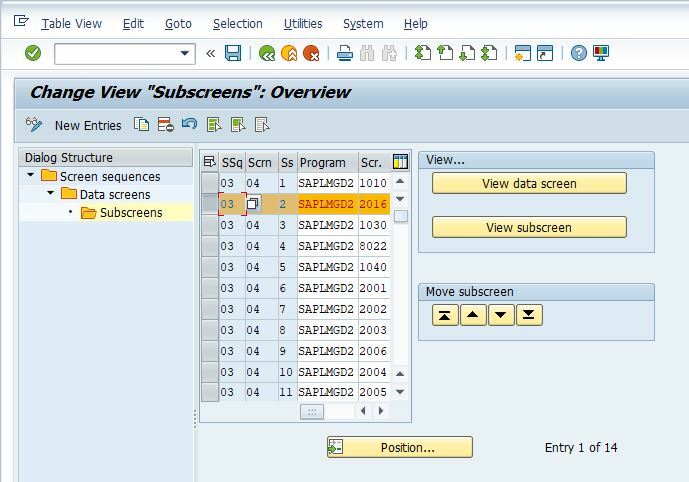 Enter all other organizational information as shown in the below screen and select views as per your requirement. Process for prepack article creation with all other details as same as other article. Also, proceed for the listing procedure as same as other article. Create Purchase order with prepack article from transaction code ME21N. Enter warehouse or distribution center as site. You only need to enter prepack article, rest all variant articles will be fetched automatically in purchase order (it is not possible to change any quantity for variant articles). Save the purchase order. Warehouse stock will be increased with prepack level only. Check it from MB52 or MMBE. Component of prepack article will be shown in STO (you will not be able to change quantity). Proceed for delivery creation and PGI. Proceed for the goods receipt posting. Check the corresponding accounting entries. Now variant article can be sold from store. In case of any requirement for packing or unpacking prepack article, we can use 319 and 320 movement type direct from MIGO transaction. 319 movement type is used to unpack prepack articles. 320 movement type is used to pack prepack articles. Please note: It is not possible to change any quantity or add/delete any variant article during packing, unpacking, purchase of prepack, stock transfer of prepack. As well as it is not possible to change structure of prepack article master after posting any transaction. There are some other functionalities are available for prepack article, please refer to the below related links. Please let me know in comment in case you face any issue during prepack process implementation. If you have time, inform us retail mm details..
Not new. I am working in retail industry since last 8 months. Learning new things beyond basic retail. Please add a information about Customizing that influences if prepack is exploded in DC/Store or logistics processes are done on prepack article level. Its posible to replenishment the material Prepack. If the answer is yes. How to configure the material for replenishment.